Leaders give speeches all the time. They speak to promote their organization’s vision and mission. They speak when the stakes are high, in times of crisis and great opportunity. 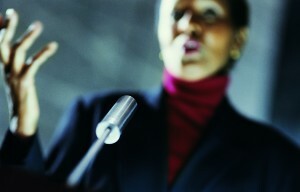 Public speaking skills and leadership skills go hand in hand. Take a stand literally. Plant your feet squarely and solidly, balancing your weight evenly on both feet. Move with a purpose, not simply to pace. And take a stand figuratively. Don’t be neutral or disinterested. Stake out a position and make your best, your strongest case for it. Brevity in a speech is always a good thing. It’ll help you hold your audience’s attention, and it will force you to focus on what matters most, eliminating all fluff. Simple is good, too, because it aids clarity and understanding. And strength is a sign of confidence and inspires confidence. Who you are — your character, reputation, values, vision — shapes how the audience hears and interprets what you say. So don’t hide off to the side of the stage in semi-darkness. Don’t cede center stage to a PowerPoint presentation. Demand people’s attention. Be yourself — your best self. And make your gestures bigger than usual. One of the best ways to gain people’s attention while giving a speech is, paradoxically, to be silent. As you begin, take your place on the stage. Arrange the microphone and your notes, if you’re using them. Look up. Look people in the eye. And take a breath. Pause. When people settle down and return your eye contact, then and only then begin speaking. Frame your most important points with a brief pause. Avoid those cutesy teaching stories you find in books or on the Internet, stories that everyone has heard, stories that have an obvious moral. Tell, instead, a story from your own life, or a story about someone you know and admire. If it’s not meaningful and fresh to you, it won’t touch your audience. See The Importance of Stories in a Speech. What tips would you add about public speaking skills for leaders?